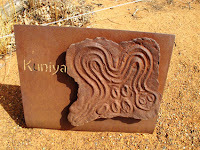 We first viewed Ayers Rock across the red plains from a walking trail near our hotel. We watched the sun set over the monolith on a cloudy evening. 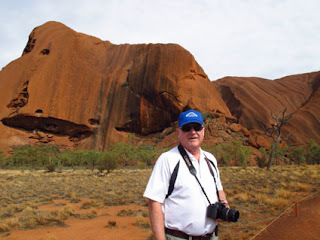 Then, after a brief early morning visit to the Cultural Center in Uluru, we actually arrive at Ayers Rock for a closer look. Walking on one of the trails that approaches the rocks, it’s not hard to imagine the spiritual power of this place. 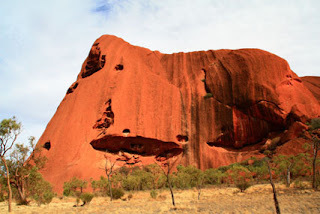 We stand at the base, touch the rocks, and absorb power ascribed to Ayers Rock by the Aborigines who live in the Red Center of Australia. 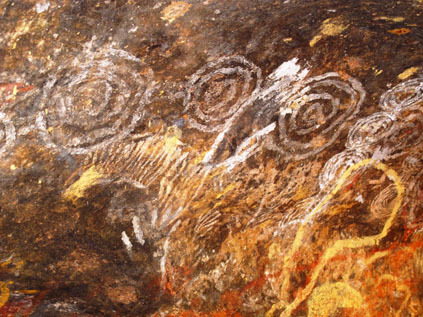 So many stories, woven into the culture and beliefs of the Aborigines, center around this desert formation. 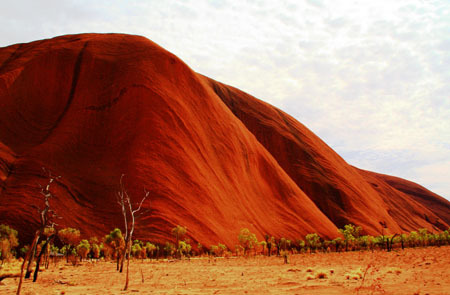 UNESCO World Heritage Site, Ayers Rock is sacred to the Aborigines and protected by the government. Although visitors do climb, there’s a strong movement to respect, honor, and preserve the art and cultural practices of the indigenous peoples, which could one day result in banning these climbs. Graeme, our guide, who has lived in the Outback of northern Australia most of his life and has great respect for native traditions, recommended a helicopter ride as a better way to see the formations. “When you climb to the top, there’s really nothing to see,” he says. “The real thing is listening and understanding all it means.” There’s also wear and tear on the rocks and safety issues—good reasons to skip the climb. So we follow his advice. We admire the 348 meter high iron-infused sandstone rock and its varied geological features. Like an iceberg, it’s estimated that two-thirds of the rock lies beneath the earth’s surface. Time doesn’t allow, or we might walk 9.4 kilometer around the base. We see chains on the path leading to the top, but the trek can be dangerous, especially in hot weather such as we’re experiencing. At the Cultural Center we see traditions more fully explained and a demonstration by an Aboriginal woman for making glue from acacia branches. A translator relays each laborious step of the process and explains how spear tips are re-attached with this glue. 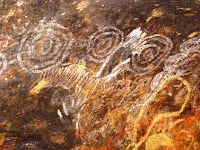 We see a belt made of human hair that men wear to hold their tools and spears, and we admire the “dot” paintings, their most renowned form of art (and very expensive to purchase). We learn that visitors need a permit to go into the nearby Aboriginal community, another way of protecting the privacy of the 250 people who live there. 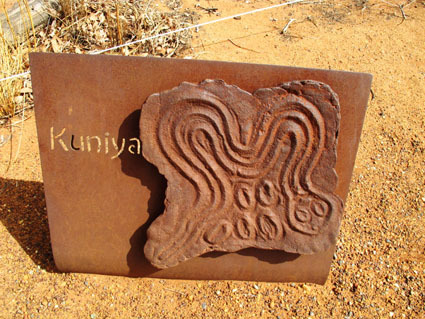 We leave Uluru with a deeper appreciation for this ancient culture and its inherent ties to Ayers Rock.